We recommend with renewed feeding to wait until the pads / granules of the previous feeding were completely eaten. The unicellular freshwater alga Chlorella vulgaris is an excellent nutrient carrier for shrimps. Even though it is costlier than Spirulina algae it has won out over the latter due to its beneficial properties. Many successful breeders have been feeding Chlorella algae for years. The following analysis shows the wide range of essential nutrients contained in these algae that shrimp need to stay vital, colorful and productive. Besides their impressive nutritional value, Chlorella algae also have further positive functional characteristics like e.g. their ability to bind toxic substances/heavy metals, which can then be excreted through the intestine easily and quickly. Especially invertebrates like our ornamental shrimps, which do not have a liver, can run into severe problems when toxic substances accumulate in their system. Chlorella algae contain chelating agents, i.e. they form complexes with toxic substances/heavy metals through adsorption, which are thus prevented from accumulating in the body. Snails and other molluscs belong to the natural food range of shrimps in the wild. They provide a great source of vital proteins and amino acids, but first and foremost, molluscs contain glucosamine (an amino sugar). Crustaceans require this substance for the formation of their exoskeleton. We have chosen squid as a source of these essential nutrients for our shrimp food recipe. Fennel is globally used as vegetable, condiment or medicinal plant. Even in ancient Chinese medicine, fennel was held in high esteem. 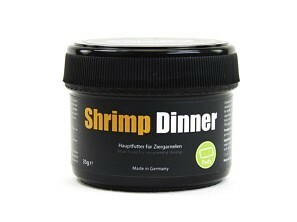 It has also proven its value as a shrimp food ingredient. Fennel contains a great amount of secondary plant substances, which have a very positive effect on shrimps. Fennel is also very rich in highly available minerals. For Shrimp Dinner, we only use the most favorite cabbage varieties used by Japanese shrimpkeepers and -breeders. Their content of vitamins, proteins, amino acids, minerals and secondary plant substances is far above average, which makes these cabbages so popular in Japan. They contain more vitamin A, vitamin C and vitamin K, more folic acid, calcium, potassium, magnesium and iron as well as more omega-3 fatty acids and fibres than other vegetables, antioxidative secondary plant substances as well as high levels of chlorophyll. Amino acids are the basic components of life itself. Only 22 amino acids are necessary to form around 100,000 different proteins. Protein is one of the main components of a shrimp's body, with around 20% of the total body weight. Amino acids are necessary for the formation of proteins. They are not only used for building muscle tissue, organs, cells, for repairing tissues and so on, but they also form antibodies against bacteria and viruses. Moreover, they are a part of the enzymatic and the hormonal system, form the nucleoproteins (RNA and DNA) and transport oxygen through the body. One of the substances necessary for a functioning nervous system (ganglia) is phosphatidylcholine, better known as lecithin. Lecithin belongs to the group of phospholipids, which are an important component of cell membranes, amongst others those of nerve cells. Phospholipds are not only mecessary for transporting ions through the cell membranes, but also isolate the dendrites (or nerve endings), thus making sure nerve impulses are transmitted securely. A shrimp transforms lecithin into acetylcholine, the most important neurostransmitter of the nervous system. The most important active substance contained in mustard seed is mustard oil. This oil only forms after a chemical process that takes place when the mustard seed is ground and then mixed with water. The sinalbin and the sinigrin that form during this process give mustard its keenness and have an appetising effect. These secondary plant substances also further digestion and are efficient against bacteria.